This color-coordinated sneaker-coat-bicycle splash of orange is enough indication that this lovely lady takes a moment to plan her wardrobe before she leaves the house every morning on her daily commute. 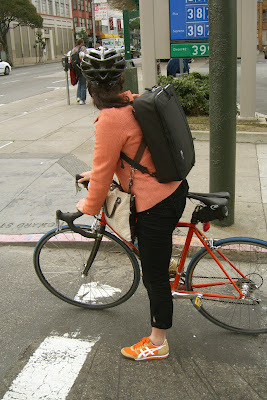 Here she is obviously calculating how much money she saves on gasoline by riding her bike to work! Love the backpack briefcase too. All she really needs to make this outfit pop is a fancy orange helmet from Nutcase.